Purnananda Buragohain, Scientist-C, NIC Assam State Centre expired on 13th June 2010, at a Guwahati hospital. He was suffering for sometime from acute pancreatitis. He leaves behind his wife and two young daughters aged 5 and 2. He joined NIC in 1993 and was the first DIO of Dhemaji District, his home town. He was transferred to Guwahati in 2003. He will be remembered for his polite manners, witty replies, his vast knowledge about nature and his interesting 'Lakhimpuria' jokes. A meeting was held at NIC Assam State Centre on 14-6-2010 to condole the sudden and untimely expiry of Purnananda. It was attended by all officials and staff of NIC, Guwahati. 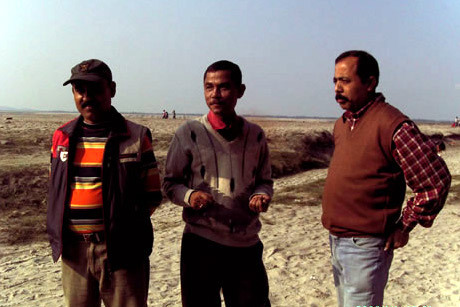 Purnananda (centre) with colleagues Ajit and Chandragupta at a picnic in 2008. It is really a sadest moment in NIC. Let us all pray to God that his soul rests in peace. - Subrata, Darrang. I wholeheartedly condole to the departed soul of Sir Purnananda. May his life be live peacefuly. - L. Sharat Singh, Udalguri. I extend my deep condolence to the brevead family. May his soul rest in peace. - Satish, Barpeta. Just last week my Grand father died suddenly. This time I heard this sudden news that Purnanada Sir also died. Our lives are in hands of God. Let us pray for his soul that God may give him eternal rest. With prayers - Valentine, Hailakandi. We are deeply saddened to learn about the sudden demise of our colleague Purnananda. We send our deepest condolences to his family. May God rest his soul in peace. - Kailash and Raman, Dhubri. Really a very sad news. We met last time during our review. We pray for his soul that God may give him eternal rest. - Mintu and Chabin, Goalpara. It is really very sad new. His face comes to my mind. May God give him eternal rest. We also extend our deep condolence to his survivors. - Ranjit and Bijoy, Bongaigaon. Its a very schoking news. We joined NIC,ASU almost at the same time. We extend our deep condolence to the bereaved family. May his soul rest in peace. - Subir and Ranjan, Diphu. I pray to the Almighty for peace of the soul of the departed, and offer my condolences to the bereaved family. - Rubaiyat, Guwahati. © 2001-20016 National Informatics Centre, Assam State Centre, Guwahati.